A great classic. If you have already tasted it, you do not need our tasting notes to confirm that you have tasted one of the greatest Havanas. If you have not tasted it yet, what are you waiting for? 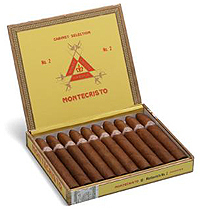 This Piramide from Montecristo is a must in every Cuban Cigar Humidor. The Monte 2 is a top selling Cuban. It has a powerful and a very rich smoke. It's made in many factories to satisfy a growing demand. The 2006-2007 productions are very good. Aficionados of this shape have renewed their patronage to this legendary cigar.